Chargers vs Seahawks NFL Week 3 Predictions, NFL Picks & Las Vegas Odds - This NFL Week 3 Predictions match-up of non-conference from the west coast features a top five passing offense against one of the worst passing defenses as the Seattle Seahawks (1-1) host the San Diego Chargers (1-1). 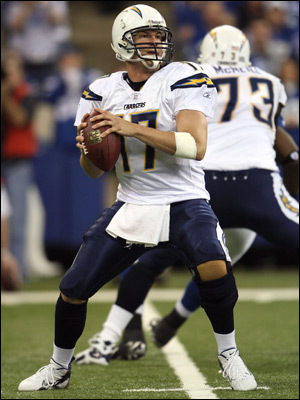 Las Vegas NFL odds has listed the Chargers as -5 -110 NFL Odds to win on the road. Though Philip Rivers and the talented San Diego Chargers offense get most of the publicity, the San Diego defense has done well. The Chargers have forced six turnovers in two NFL Picks games, including four interceptions, while opponents have only scored three offensive touchdowns. The defense led by some unfamiliar names, including leading tackler Steve Gregory at safety, Antoine Cason at cornerback with two interceptions, and linebacker Kevin Burnett. Linebackers Stephen Cooper and Shawne Merriman have combined for only seven tackles but they are still players to watch. The San Diego secondary will be ball-hawking against Seattle’s quarterback Matt Hasselbeck. Hasselbeck has thrown four interceptions against three touchdowns but has also passed for over 400 yards. He will be looking to throw over the top against the Chargers’ pass defense with receivers such as Mike Williams and Deion Branch. Tight end John Carlson is a good red zone target. The running game has been spotty, with Justin Forsett an underutilized weapon. They could turn him loose against the Chargers, especially if Seattle gets a lead. Betus.com has listed the total in this NFL Odds game between Chargers vs Seahawks at 44½ points. This NFL Picks game features a gross mismatch between the San Diego passing attack and the Seattle pass defense, enough to put the Chargers over the top in a road win against a tough non-conference foe. Vegas-spreads.com NFL Week 3 Predictions & Picks: Bet on the road team San Diego Chargers to get the win and cover the Las Vegas Odds.